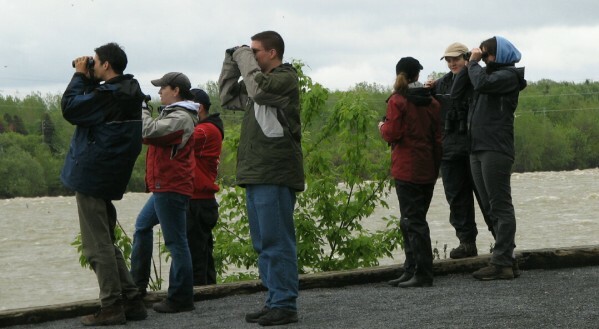 The MBO Birdathon Team (Marcel Gahbauer, Marie-Anne Hudson, Barbara Frei, Lina Bardo, Steven Dedesko, Manon Dubé, Sarah Fraser, Barbara MacDuff, Lance Laviolette, Mike Mayerhofer, Sandy McNeil, and Chris Murphy) accumulated a list of 120 species on Saturday May 20. The weather was rather dismal, with a steady temperature of around 10 degrees, and light showers throughout the day with only brief breaks - and an unpleasant wind at times too. It was worth persevering through the weather though (see the highlights below), and though we know we could have done much better under drier skies, we're very happy with the results under these circumstances. Thanks to all who took part, and just as importantly, all those who sponsored us to raise money for MBO! How could we start anywhere but MBO? Aside from loyalty to our site, warbler diversity in recent days has been as good here as anywhere else in the Montreal area. We weren't disappointed. Our walk of the census loop produced 50 species, including three new ones for the year: Indigo Bunting, Mourning Warbler, and Yellow-bellied Flycatcher. We didn't encounter any of them again elsewhere, and likewise our only Blackburnian Warbler, Wilson's Warbler, and Purple Finch came here - the latter perching obligingly along the road as we put our first entries on the checklist. 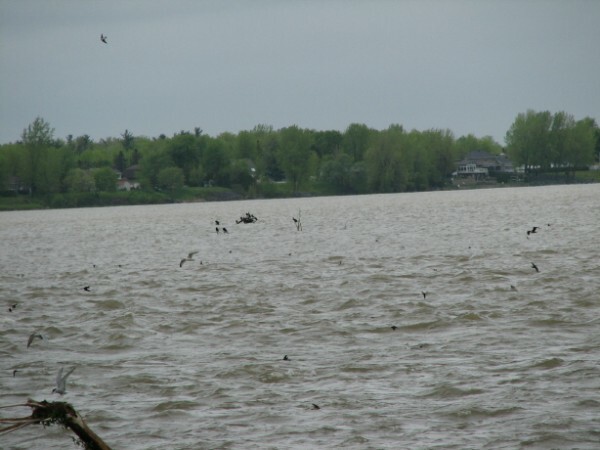 Our second stop, at Ile Bizard, boosted our total to 84 species. A brief walk north from the parking lot yielded our only Tennessee Warbler, Blackpoll Warbler, and Red-breasted Mergansers of the day, but the gusty winds there convinced us to turn back before long. The main boardwalk was very disappointing in terms of waterfowl, but it was otherwise rewarding, with nice looks at Black and Common Terns, plus Belted Kingfisher, Green Heron, Common Moorhen and Pied-billed Grebe. Also near the path, but well-hidden, were both Sora and Virginia Rail. The woods beyond proved to be a bit much of a time sink, but did give us some important additions for the day, including Scarlet Tanager, Yellow-bellied Sapsucker, and Red-eyed Vireo. 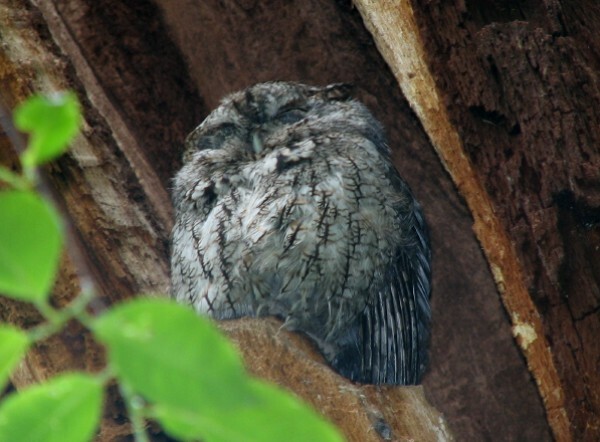 This site was new for the majority of participants, and we were all grateful for the expert leadership of Chris Murphy, both in terms of navigating us along the roads to find the park, and for leading us to the Eastern Screech-Owl and some nice pockets of warbler activity. A Ruby-crowned Kinglet with black flecks on the head was an interesting sight, as were two Northern Parulas perched less than a metre away from the sleeping owl, chipping at agitatedly. At the lookout, our only Ruby-throated Hummingbird of the day whipped by overhead. 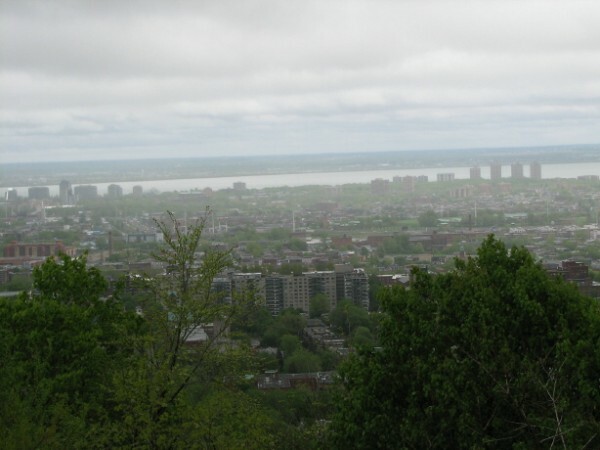 From rue Martel, we scanned the Chambly Basin and had some nice sightings. Off to the north we spotted 8 Common Loons together on the water, and over near the east side were at least half a dozen late-lingering White-winged Scoters. As we were watching them, a large flock of about 200 Brant flew in from the southeast and settled on the water. 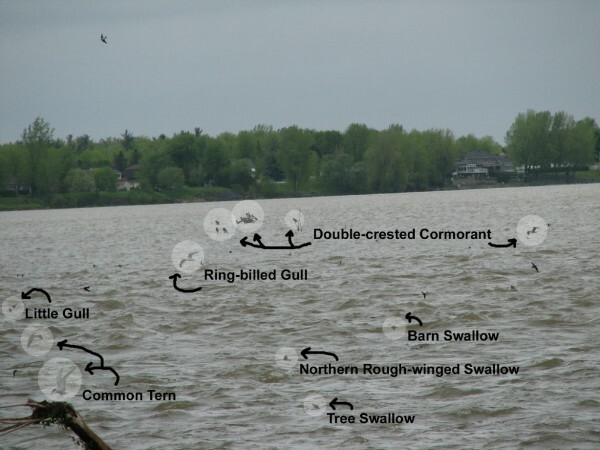 From rue Martel, we could see what appeared to be another 20 Brant near Fort Chambly, but little did we know how many other highlights we would discover there. Almost as soon as we got to the corner lookout, we spotted 3 Little Gulls in spectacular full breeding plumage. Nearby for comparison were 4 Bonaparte's Gulls, including one in breeding plumage, and dozens of Common Terns (we searched in vain for an Arctic or Forster's Tern among them). Sharing the airspace over the river were all 6 swallow species and some Chimney Swifts. We spotted nests of both Cliff and Northern Rough-winged Swallow, but Barn were by far the most common of the swallows. We also added to our meagre raptor count with a Turkey Vulture and an immature Bald Eagle soaring across the river, bringing our total up to 100 species. Over the previous week, all 3 phalarope species had been reported from the flooded fields in and around St-Blaise, as had many other shorebirds. Unfortunately, our sightings were limited to Greater and Lesser Yellowlegs (kind enough to pose for side-by-side comparison), plus Solitary and Spotted Sandpipers. Despite all the flooding, the only ducks we could find in the fields were Mallards. However, we made up for those disappointments by adding on unexpected species such as Snow Goose and Common Merganser, and also with a nice view of a female Northern Harrier under attack from local Red-winged Blackbirds. We made a brief side trip up rue Melaven to the Marcel-Raymond Reserve, hoping for Blue-gray Gnatcatcher or an early Willow Flycatcher. 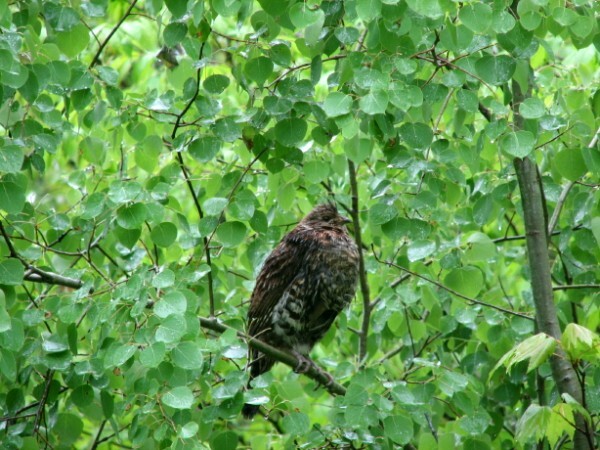 These we could not find, but a Ruffed Grouse perched in a small aspen right by the road was more than interesting enough to compensate for their absence. There was also a fair amount of warbler song, but nothing else new for the day. At last our luck ran out a bit at Philipsburg. A brief foray along the trails made us face two realities: the rain had made the paths extremely muddy and treacherous even away from low-lying spots, and aside from Baltimore Orioles, the birds seemed to be largely silent. In better weather and earlier in the day, it probably would have been a very productive stop, but it wasn't to be this time. At least we were able to add Eastern Bluebird to the list before heading back west. Barbara's knowledge of the area paid off with a nice field full of Bobolink song, and with an obliging Brown Thrasher calling nearby as a bonus. Just down the road we added Eastern Meadowlark to give us at least a modest representation of grassland birds on the day's list. By the time we reached this area, it was already getting dark, and the wind was picking up again. Nonetheless, we parked and took one final walk along a gravel sideroad, and were rewarded with our last two species of the day. A Wilson's Snipe took flight up ahead, and a few minutes later, the darkening sky became the backdrop for at least half a dozen male American Woodcock performing their spectacular display flights. Since we only started the Birdathon at 6:00 a.m. on Saturday, we technically had until 6:00 a.m. on Sunday to find species, so the first hour of Sunday's banding session was fair game. Sure enough, the first walk down to the end of the B nets yielded a persistently singing Northern Waterthrush to bring our total to 120. The list below includes all of the species seen and/or heard during our Birdathon. We did very poorly with waterfowl (10 species) and raptors (4 species), and our list of shorebirds (7 species) was also much shorter than expected. However, we did quite well with warblers (19 species) and passerines on the whole (72 species), and had good luck with some birds often difficult to find on Birdathons, such as the woodpeckers, grouse, and owl. We are already looking forward to better weather and even greater results in 2007!